Once upon a time, Mark Bego and Madonna discussed a movie called Desperately Seeking Susan! Welcome to our Exclusive Interview with Mark Bego! Madonna was a superstar before she was a superstar. She knew she wanted the biggest piece of cake, and the lead in every talent show. She also knew she wanted to be known by only one name, like other femme fatales and legends before her. Did she know back then that very early in her career she would warrant her first biography? That with only one album out and no concert tour she would give enough ink for a good 189 pages? She may not have known, but our featured exclusive interviewee, Mark Bego, sure did. MadonnaMemories is pleased to present our exclusive interview with the man who put pen to paper on our favorite goddess and helped expand the myth and legend that is Madonna. Thank you, Mark for sharing your insight on the great lady of the 80's! Well, I want to thank you for asking me to reflect back on the success of my first book on the ‘Material Girl’ herself, which was entitled Madonna! (1985). It was so beloved and successful that it spurned two more in-depth and expanded versions of the book: Madonna: Blonde Ambition (1992), and the latest up-date on it: Madonna: Blonde Ambition (2000 Cooper Square Books). I have always predicted that Madonna would have a very long lasting career in show business, and I am thrilled to see that 20 years since the release of Madonna!, that I was indeed correct. First off, what was your very first impression of Madonna? Did you think even then that she was going to stand out? Did she have that certain spark? The early 1980's were something of a magical time for me. I was involved in so many different creative projects, and I was surprised to find that one way or another, they all seemed to intersect somehow with the growing career of Madonna.. I knew all about the first Madonna (1982) album, in sort of a bittersweet way. David Salidor, who is my publicist, and one of my best friends, had a client by the name of John Benitez, who went by the name of “Jellybean.” I knew Jellybean in that he was the disc jockey at a nightclub called The Fun House. He was dating Madonna at the time. He was also an aspiring record producer. Meanwhile, I was trying to expand my career into managing celebrities’ careers as well. I was at the time doing some consulting work with a dear friend of mine, Mary Wilson of The Supremes, and I was trying to get her a record deal. To make a long story short, in my efforts to land her a recording deal, I set up a meeting with Mary Wilson, Jellybean, David Salidor and I. Jellybean had a song that he had the rights to, called “Holiday.” Phyllis Hyman, who was currently recording for Arista, had already passed on the song. When Jellybean heard that Mary would be interested in hearing the song, he loved the idea of her recording it. Basically, if Mary liked the song, Jellybean would pay the production costs for Mary recording it. Jellybean played the song for Mary, and there was a moment of silence after the demo had finished playing. Finally, Mary formulated her thoughts, and told us what she thought of the song. I couldn’t wait to hear her opinion, as this was going to be my entree into the world of record production. Both David and I had these grand illusions of becoming “associate producers” of this record we were convinced could be a hit. “Holiday...celebrate...holiday...celebrate...holiday celebrate?” Mary said with an less-than-pleased look on her face. “That’s not a song, that’s just two words repeated over and over again. Thanks for playing the song for me, but no thanks.” That was the end of that. Well, only days later there was a problem with one of the eight songs that were slated for the Madonna album, and they had to find another track. Jellybean convinced Madonna to record “Holiday,” and it became her first Top Ten Pop hit. In 1982 I was working at CBS Records, specifically in the Columbia Record Club division. As a staff writer, it was my responsibility for writing little pieces of “direct marketing” sales copy about specific record albums. If you are–or ever have been–a member of Columbia Record Company, you know that every month you get a little catalog showing you what albums–vinyl albums at that time–that are available to you. The first time I wrote about Madonna was one such piece of promotional copy for Columbia Record Club. Well, Danceteria was a big part of Madonna’s career development. She used to go to Danceteria with friends to dance. Finally one night she convinced the second floor disc jockey, Mark Kamins to play one of her songs, “Everybody,” on the dancefloor one night. From Danceteria she got to Kamins, from Kamins she got to Seymour Stein, and via Seymour Stein she was signed to Sire / Warner Brothers Records. Through all of these coincidences, I had a vast awareness of who Madonna was. Every time I turned around it seemed that she and I were at the same places, but at different times. David and I would go to The Fun House to visit Jellybean in the D.J. booth, and Jellybean would announce to me, “Oh Madonna was just here. She just left.” It was inevitable that I would eventually meet her. Prior to meeting her, what impressed me the most about Madonna was that I loved the music. This was also the beginning of the whole video era, so I loved the self-confident and slightly brash attitude she projected while singing songs like “Burning Up” or “Physical Attraction.” She exuded such an in-control sense of self-confidence, that as a singer, she appealed to me on several levels. Since I am a product of the whole Studio 54 era, I had watched “disco” come and go. I was thrilled that Madonna was suddenly bringing back dance music and putting it on the charts in a very big way. What made you decide to do a biography on her? What was it like getting that project off the ground and also being able to have Madonna's input in it through interviews with her and other people in her life? In 1983 I had begun a job as the Editor-In-Chief of Modern Screen magazine. At the time I had also written a book on Michael Jackson which was entitled Michael! I was fortunate enough to have really “caught the wave” on predicting that Jackson was going to be the hottest person on the music scene in 1984. My book Michael! ended up being released the week that Jackson caught his hair on fire filming the Pepsi commercial. Due to this, I ended up selling three million copies of Michael! in seven languages. The publisher who put out the Michael! book suddenly looked at me as though I had something of a “crystal ball” ability for predicting who was going to be “hot” before the general public got wind of it. I distinctly remember going to a board meeting at Pinnacle Books to tell them of my latest prediction. Well, I was so passionate about my presentation and my conviction that the executives at Pinnacle Books decided to listen to me. Several days later I found myself signing the contract to do the book called Madonna! Again I was correct. I was truly on a hot streak, as the Madonna! book came out in 1985 I was indeed correct with my prediction. 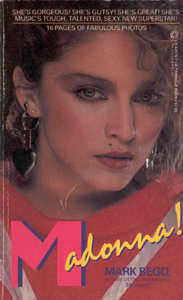 It went on to sell a million copies, because as I had visualized, the year 1985 truly belonged to Madonna. Just for the record, the following year I predicted the success of three more up-and-coming stars, and became the first author to write books about them too: Whitney Houston, Sade, and Julian Lennon. cooperate with me on my book. Madonna did have a way of forging relationships during this era, gleaning what she needed from them, and then moving onward. Jellybean would have never grant me an in-depth interview about Madonna while he was dating her. Fortunately for me, Sean Penn came into the picture in January 1985, Madonna dumped Jellybean, and he was more than happy to talk to me. Mark Kamins was another person who was pivotal in Madonna’s career. He introduced her to Seymour Stein, produced one song for her, and was pushed off to the wayside. He was more than happy to talk with me. One of the nicest and most gracious people from the Madonna camp was always the jewelry designer, Maripol. She was more than willing to talk to me about her input in Madonna’s fashion sense. She would help put together the looks that Madonna sported at photo shoots, like the calendar she posed for in Hawaii, frolicking in the black sand. One of the things that Maripol said to me during that interview always stuck with me. I asked her why she was having Madonna mix all the religious medallions. She would have Madonna wearing crucifixes and Stars of David together, combined with amulets from Eastern religions. I always loved that line. I now have my own line of jewelry on my website. I love to use colored gemstones because they all have healing properties and good luck attached to them. Let me tell you: It is all good voodoo, baby! 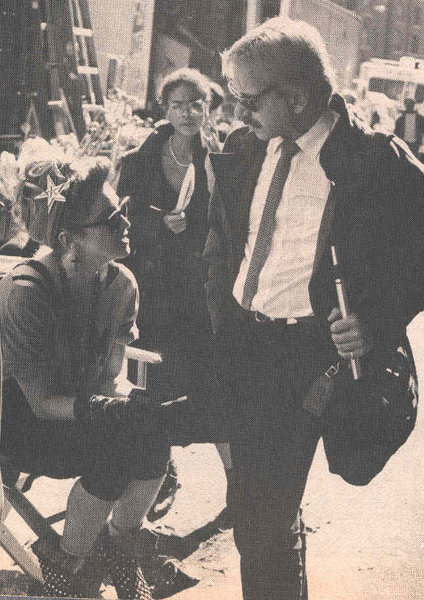 You got to interview Madonna on the set for Desperately Seeking Susan. What was that like? Was she aware of her massive success even back then or was she still in awe of the whole thing? 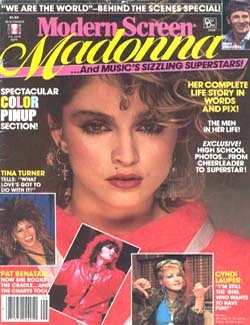 My initial meeting with Madonna was for a cover story in Modern Screen magazine. I interviewed her at the loft that Maripol lived and work in at the time. It was on Broadway, just north of Houston Street. The second time I saw Madonna was on the set of Desperately Seeking Susan. The site was an abandoned building in Harlem that was being used for several different scenes. That’s where the exterior and the interiors for The Magic Club were shot. I went up there with my photographer from Modern Screen, Roger Glazer. I only spent a few minutes with Madonna that day, as she was trying to memorize her lines for the scene that she was about to shoot. I did however get to talk to her. I told her that I had seen her on the MTV Awards and loved it. Roger took our photo together as Madonna and I chatted. It appears in all three editions of my Madonna books. Roger and I also received a guided tour of the interior sets, including The Magic Club, and the dressing room of that fictitious club. If any of you reading this have ever been on a movie set will know what I am about to say is totally true: things take forever on a movie set! There is so much time spent setting up a scene for what becomes mere seconds of a film. They were filming a taxi cab scene with Madonna in the cab. They must have set up and filmed this 15 second sequence 20 times. Madonna was more than aware of her success. I had just seen her rolling on the floor of Radio City Music Hall singing “Like a Virgin” on the First Annual MTV Awards only weeks before. She was playing at her success like she was calculating to win a chess match. She seemed to be absolutely focused at all times. Let me tell you, “awe” was not an emotion that I saw on Madonna’s face. I met her and spent time with her on three occasions during this era. I found on each of these occasions she always had a certain “coolness” about her. She was always nice to me, but at the same time she had a sense of reserve. Now, as you read this you may think, “Well maybe that was Mark Bego’s fault. Maybe he acted like some demented fan.” But it really wasn’t the case. I had been used to interviewing celebrities at this point. I knew everyone from Andy Warhol to Peter Max in the art world, to Patti LaBelle, The Doobie Brothers, and The Village People. I’ve traveled around the world with Mary Wilson, and been the houseguest of Rita Coolidge, Melanie, and Martha Reeves. Pia Zadora and Sandy Duncan both gave me tours of their luxury apartments. I am gonna give it to you straight: Madonna was a bit stuck-up, and a bit stuck on herself. Working for Modern Screen in the ‘80's must have been a dream job! Do you have any fun or funny stories from that time? I was so excited to have landed this job. I had been working on magazines and newspapers for over a decade by 1983. 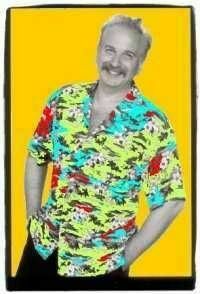 From 1978 to 1980 I was the Nightlife Editor of a magazine in New York City called CUE. When that suddenly ended, I dreamed of having my own magazine. Quite simply put, Modern Screen was a blast to work for. I really wanted to pull out all the stops when my first edited issue of Modern Screen was published. So, I hosted a huge party at a discotheque that was in the Times Square area, called Panache. I invited the press, all of my friends, and all of the employees of the company who owned Modern Screen. I had a real mixture of celebrities who attended that evening. Phyllis Diller was there. She was an absolute riot to meet. Tiny Tim was there. He was a total trip. My Aunt Linda was there and she went up and asked him how his daughter, Tulip, was doing. Lou Christie, the ‘60s singer of “Lightning Strikes” was there, as well as Randy Jones of The Village People, and Nick Nolte. In the middle of the party Mary Wilson swept in with Lorna Luft, comedian Marilyn Michaels, and fashion designer Tony Chase. They arrived straight from one of Tony’s fashion shows, and they were all dripping in fur and sequins–including Tony. That party was great fun, and so were all of my two years at Modern Screen. In addition to interviewing Madonna, I also met, interviewed, and hung out with a varied group of stars. I interviewed Tom Hanks when he was just starting out his acting career, and I became chummy with Bonnie Bedelia the year that she was nominated for an Academy Award for Heart Like a Wheel. And I spent three months on the road following The Jackson’s “Victory Tour” across the country. Since Modern Screen magazine was a fan magazine, I would have to come up with all sorts of bright ideas for celebrity giveaways. For a Valentines Day issue, I remember that I devised this contest which I called “Win a Kiss From Your Favorite Star.” From that point on, every time I encountered a female star at a party I would ask them to participate in the contest. What I had them do is apply an extra coat of lipstick, and to give me their lip print on a piece of white typing paper, and then autograph it. It was a cute idea, and it was quite a hit in the magazine. I ended up getting several stars including Arlene Dahl, Mary Wilson, Melanie, Grace Jones, Bonnie Bedelia, and even Sophia Lauren to give me their kiss on paper. To be perfectly honest, I made them all give me two of their kisses on paper, and I kept one of each. Unfortunately, Madonna did not give me her kiss. It wasn’t that she declined, that contest was during the period before I met and interviewed her. Part of our upcoming time capsule is capturing great ‘80's quotes from Madonna. Any that stick out in your head from your interviews with her or things she said that you really liked? I will never forget my interview with Madonna at Maripol’s loft. I was so excited to find out that she grew up in the same city I was born in: Pontiac, Michigan. As all of you Madonna fans must know, Madonna’s family lived in Pontiac, but she was physically born in Bay City, Michigan, when the family was visiting relatives and her mother went into labor. Anyway, I was so looking forward to saying to her, “Madonna, we are actually from the same hometown of Pontiac, Michigan!” I so thought that it was going to be one of those little bonding experiences between the two of us. However, I have to admit her “tough as nails” attitude, has always served her well in a survivalist sense. One of the things that she did say to me the first time I interviewed her was, “Life is too short for me to not get everything I want.” Although she said it in an off-the-cuff sort of way, that was something that really stuck with me. She had a point. Why should we let anyone get in the way of our dreams? Madonna has always had a clear cut vision of what it is she wants, and she has always “gone for it.” I salute her for that one. Twenty years later, she is still at the top of her game. In meeting Madonna and talking to her, what is something about her that you think fans would find surprising? Did she ever do anything that surprised you? I think that Madonna has a career that is built on a series of surprises and media manipulations. I know that recently there was a controversy about the song “Isaac” from the Confessions on a Dancefloor album. Based on the life of a Kabala preacher, the song drew criticism from Jewish scholars. Well, guess what? Madonna has always gone out of her way to question religion, and to incite controversy. She has pissed off the Catholic church on several occasions. There is not surprise here. Tell us about some of your upcoming projects or recent projects. Will there be any Madonna projects in the future? I would never have guessed that I would already have updated the Madonna story twice by now. However, I am more than ready to do it again. The success of Confessions on a Dancefloor might make it necessary for me to do it even sooner. I certainly will keep you posted on this. Speaking of Confessions on a Dancefloor, although you did not ask me specifically about my opinion of it, I would love to go on record as saying that I think it is an absolutely brilliant album. The hit single, “Hung up,” is perfect. She has a real hit on her hands. This is truly her best album since Ray of Light. I love it. What advice do you have for writers who might be interested in going into this line of work? How would you go about getting involved in writing about celebrities or being involved in publications like the ones we see on shelves today? Well, all I can really tell you is how I did it. I used to write for my high school newspaper, and I reported high school news for the local 80,000 copy circulation newspaper called The Pontiac Press. When I went to college I received a degree in journalism, and I wrote for the campus newspaper, Central Michigan Life. I soon learned that if I reviewed record albums for Central Michigan Life, that I would get free albums. Well, as a result of my album review column, and my reporting on theater and concerts, I received a phone call one day from ABC Records. Well that was how it started. I moved to New York City three weeks after I graduated from college, and I never looked back. I did everything I could to get in print. I wrote for the music industry trade magazines for $5.00 an article at the beginning of my career, but I made it work. My first national magazine article was for US magazine, and my assignment was to get Katherine Hepburn to let me interview her. Well I made it happen. Before long it was books that I got involved in, in a most round about way. I landed a job in the contracts department of Grosset & Dunlap Publishers. To make a long story short, it was that same publisher who bought my first two books, on Barry Manilow and The Captain & Tennille. My advice: Well if being a writer is what you want to do, by all means do it. Come up with a story idea, get on the phone, and pitch it to an editor. I made it work, and I have written 50 books since then. Tell em, Mark Bego sent you! Thank you so much, Mark, for a chance to interview you! Having you be a part of the 1985 time capsule is an honor for us. We appreciate the trip back to 1985! Thanks so much for asking me to do this. 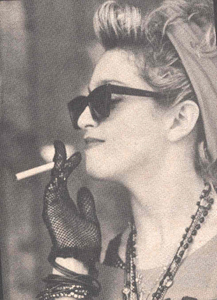 You have coaxed me into recalling so many Madonna memories from 1985, and I had a great time doing so for you. I feel like I just got out of the “Way Back Machine” with the cartoon characters of Sherman and Mr. Peabody! It was a fun era of Madonna mania, and I am thrilled that I was there to see so much of it first-hand.